For occasional use to soften, loosen and remove excessive earwax. Adults and children 12 years of age: tilt head sideways and place 5 to 10 drops into ear. 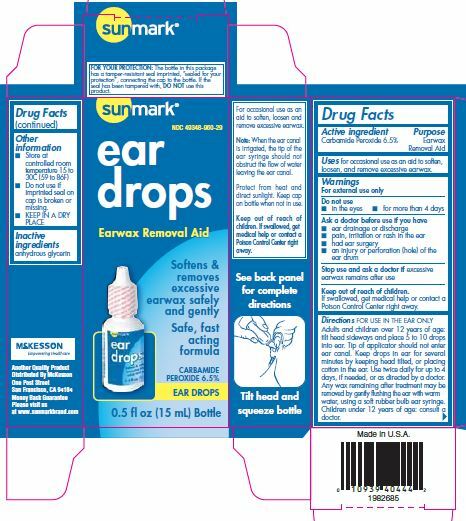 Tip of applicator should not enter ear canal. Keep drops in ear for several minutes by keeping head tilted, or placing cotton in the ear. Use twice daily for up to 4 days, if needed, or as directed by a doctor. Any wax remaining after treatment my be removed by gently flushing the ear with warm water, using a soft rubber bulb ear syringe. Children under 12 years of age, consult a doctor. Do not use if imprinted seal on cap is broken or missing.